Screw the bike, Ima ninja! Hmmm, i prefer that bike! The green goblin starts his criminal intentions early..
A true ninja waits until the prey is completely unaware of his presence. Then he strikes with precision. Then he leaves, either leaving no trace, or making things seem as an accident. Flawless. Hey, look what Chuck Norris taught me, bike surfing! WHAT DID YOU SAY ABOUT MY MOMMA!?!?!?! 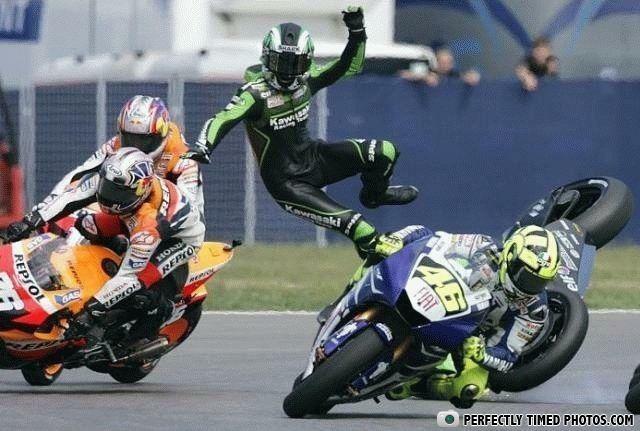 they should ban kawasaki ninjas from participating..dammit! I thought this would be easier from the way the Wheel Man dude did it. Screw this bike I want yours now! JACKIE CHAN wins the race in his own way! Rossi must be like, WTF?! Ninja!!! Why are small clowns and baby's alike? They both dreadfully die when hit in the face with an axe!